Marshall Steele's "Dolly's Skates" came from a Victorian children's reader called "Little Bright Eyes" compiled by Helen Marion Burnside, Antony Guest and S.E. Bennett, found in the University Of Florida's Digital Collections. The book was inscribed: "A prize awarded to Ethel Margaret Smith for Good General Progress. Christmas 1898." This piece beautifully puts the importance of skating in the perspective of the holiday season. Pour yourself a cup of holiday cheer and have a read! "You know, mother, I do really think I deserve them." And Dolly's big brown eyes looked up very gravely into her mother's. "Oh, and why?" said mother, trying to hide the smile that would turn the corners of her mouth. "Because I have saved and saved, you can't think how hard, and so long, too - I should say it was years. And I haven't bought anything, no sweets, and no tea-sets, and - nothing." "Oh yes, you have!" said mother, looking down very tenderly at the little face up-turned to hers, and giving Dolly's hand a little squeeze as they walked briskly along the frozen street. "You gave Daddy that nice pocket-book on his birthday, and me that beautiful fuchsia, on mine." "Why, of course; what's the good of mothers and daddies if you can't give them things?" "What, indeed?" said her mother. "And now you are going to have your reward for saving." "Yes," cried Dolly, nodding her little head till the bright brown locks shook themselves loose beneath her pretty red hood. "Now I am going to buy my skates - four shillings and threepence." She said "four shillings and threepence," because it sounded so much more important than "four and three." At the thought of the purchase she was going to make, she began tripping merrily along by her mother's side in little polka steps, and then suddenly dropped into a very quiet and well-behaved style of walking. "Oh, I forgot," she said. "Nurse says ladies don't dance in the street. But I am so happy, because I'm going to learn skating, aren't I, mother?" She held her little head up very proudly, for it really is a great and wonderful thing to learn skating when you are only six. Why, there was her cousin Nellie only just beginning to learn, and she, as Dolly said, was almost quite growed up - sixteen, or some enormous age like that. "Let us go down here," said mother, and they turned into a bye street full of poor shabby cottages. "It's a short cut, and the road is sure to be clean in this hard frost." They were not quite so merry now, for mother's eyes were grave and sad as she looked from time to time at the unwholesome dwellings and the poor shivering people who came in and out of them; and Dolly, seeing the children playing in the streets, and noticing what poor shabby clothes they had, and how few even of them, felt somehow - she could not understand why - a little ashamed of herself. But the poor children seemed happy enough, and laughed and shouted and scampered about. Presently, to her great surprise, Dolly noticed a little girl, rather younger than herself, running down the street, holding in her arms a lovely wax doll, dressed in the height of doll's fashion. Just then the most terrible accident happened. The little girl was stepping on to the path, and was so wrapped up in her beautiful doll that she did not notice she was crossing over a slide the boys had made. At that moment a boy came flying down like the wind, and he accidentally knocked the doll out of her hand. The boy behind him, not having time to stop himself, stumbled against it, and in recovering himself trod right on the doll's face and smashed it to pieces. Just as he jumped off it, a mischievous fox terrier jumped on, and seizing the doll in its mouth tore its beautiful clothes to tatters. The poor little owner of the doll set up a dismal and dreadful howl, and Dolly felt inclined to cry with her. She dropped her mother's hand, and ran over to the little girl. "O, little girl," she cried, "I am so very sorry for you." The little girl stopped howling and looked up surprised that anyone who looked like a fairy out of a story book should stop to speak to her, and to speak so kindly too. "Who gave it to you?" Dolly went on. "I dot her at a treat yast night," said the little girl, sobbing again quite bitterly. "The kind lady dave it me. O, my booful dolly - my booful ickle dolly!" Then Dolly ran up to her mother with tears in her pretty brown eyes. "Mother," she said, "I don't want to buy any nasty skates. I want to buy that poor little girl a new doll." "So you shall, my darling," said her mother. "Is this your little girl?" she went on, turning to a respectable woman who, at the sound of crying, came hurrying down the street, drying her arms on her apron. "Yes, ma'am; and whatever the poor mite 'ill do without her doll I can't say. It's cruel hard." "My little girl," Dolly's mother went on, "has been saving up her money to buy herself something; but she tells me it will make her much happier if she may buy your child another doll. May she?" "It's a true lady you are, ma'am, to ask me like that. And I say God bless your pretty darling for thinking of such a thing. It will make my Rosie as happy as a bird in spring; and she don't have more happiness than she can do with." So Rosie and Dolly and Dolly's mother went off hand in hand to the toy shop, and there Dolly bought the prettiest, daintiest doll, with flaxen hair, and clothes that you could take off and put on again. And when Rosie kissed Dolly and ran away, with her little heart full of joy and pride, Dolly felt consoled for the loss of the pleasure she had been looking forward to. "I am the wee-est little bit sorry," she whispered to her mother, as they trudged back; "because I did want the skates very badly, but I'm much more happier." When Daddy heard the story, he looked very proud of his little girl as he bent and asked her whether she would like him to give her a pair of skates. "Oh no, Daddy, dear," said Dolly. "That would spoil everything." So Dolly's skates have still to be bought; but she has begun to save up again for them, and I think she will have enough money to buy them before the next frost comes. Photo courtesy the City Of Toronto Archives. Fonds 1257, Series 1057. Used with permission. 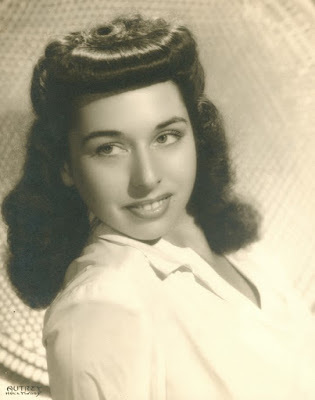 Born February 11, 1918 in Toronto, Ontario, Audrey Elinor Miller was the daughter of Toronto born salesman Herbert Edmund Miller and Wisconsin born Gladys Violet (Adams) Miller. Like so many great Canadian skaters, she spent her winters toiling away on patch sessions at Toronto's prestigious Granite Club. A late bloomer by today's standards, her first big success came at the age of twenty one when she placed a creditable third in the junior women's event behind Mary Rose Thacker and Norah McCarthy at the 1937 Canadian Championships. The following year, she moved up to second in the junior women's event behind McCarthy in a field of six. 'Skating up' in the senior women's event, she placed sixth, well below winner Eleanor O'Meara. The January 22, 1939 issue of "The Daily Illini" noted she was "famed for her her interpretive free skating." 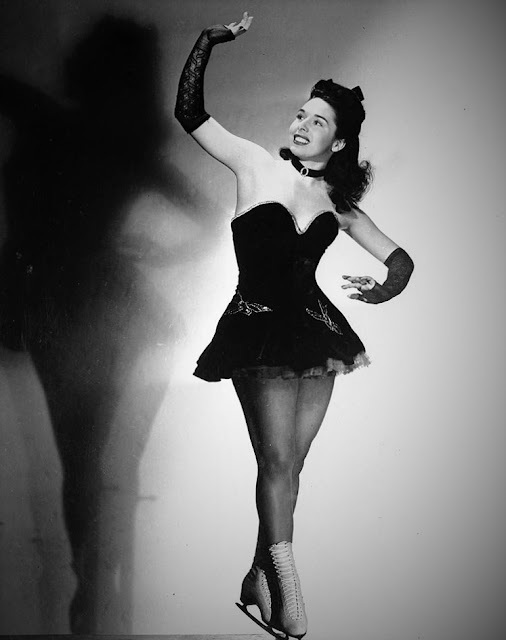 As was the case with many promising skaters at the time, World War II got in the way of her competitive aspirations and the lure of the almighty dollar beckoned at a time when Sonja Henie fever was at its height. Audrey turned professional in 1942 and for a time skated in the Ice Follies and in shows in the restaurant at the Hotel New Yorker before moving to California and taking a job as the chorus director for film and ice show producer Boris Petroff. 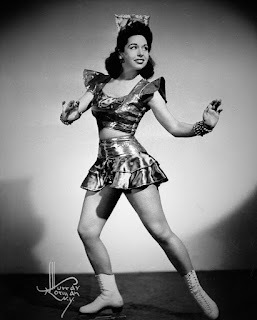 While there, she skated in the first major ice show in Long Beach, "Hollywood On Ice". When the Canadian National Exhibition rebooted up again in 1947 after the War, the organizers were eager to capitalize on the Barbara Ann Scott craze with a midway attraction like no other: an ice show. Barbara Ann or Belita she was not, but Audrey certainly had some lovely eight by tens and more than a few industry connections. 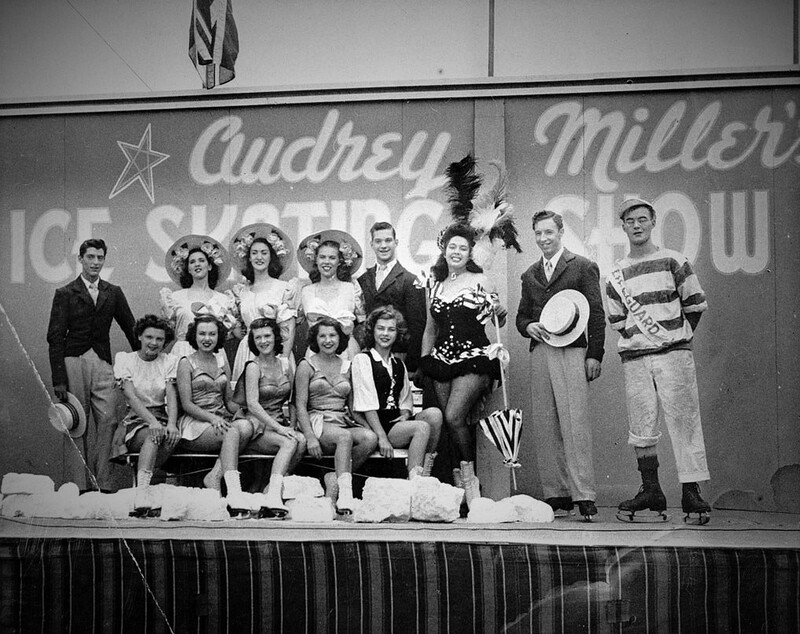 After a stint teaching at the Iceland rink in Berkeley, she put together The Audrey Miller Ice Show - the CNE's first skating production - which opened in 1948 in a twelve thousand seat big top previously used for Terrell Jacobs' Wild Animal Circus. It later moved to a more permanent structure designed by Jack Ray and Joe Drambour, the midway architect for Palisades Park. 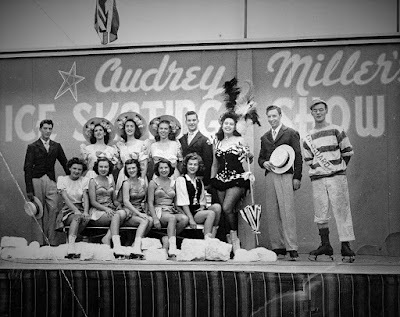 The Audrey Miller Ice Show was performed up to ten shows a day on a twenty by twenty four foot ice surface, replete with its own ice-making equipment. The cast was mainly Canadian, and including an eight woman chorus and two to four male performers, mainly cast from the hotel ice show circuit. Audrey skated one of her big solos to "My Moonlight Madonna". It was the unheralded Canadian's first and only major big and sadly, it was a short-lived one. Photos courtesy the City Of Toronto Archives. Fonds 1257, Series 1057. Used with permission. Audrey packed it back up and headed back south to California and took a job directing ice revues at the St. Moritz Figure Skating Club with fellow Canadian Hubert Sprott before marrying Darragh Phelan and moving to Florida. 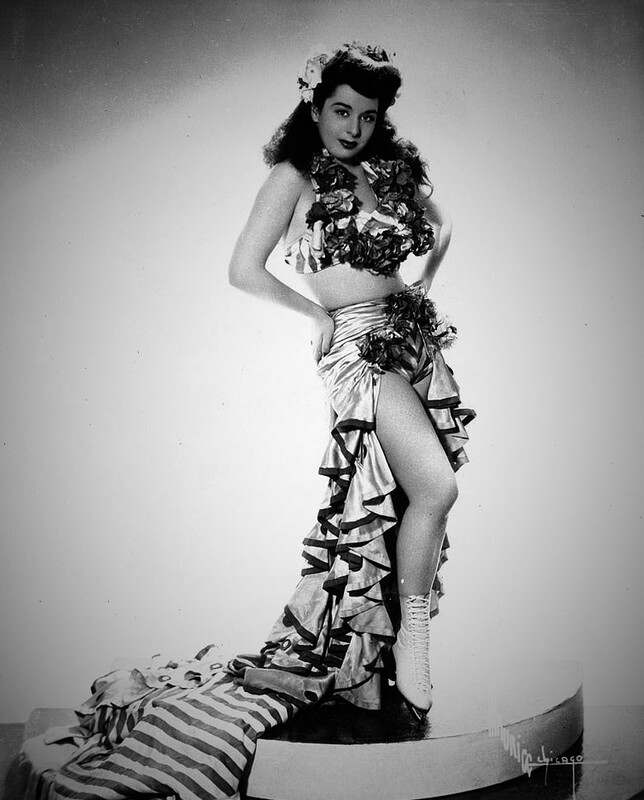 If Audrey Miller's Ice Show wasn't obscure and compelling enough for you, wait until you hear about her life afterwards. Audrey caused a huge raucous in July 1944 when she showed up in a U.S. District Court in St. Louis to apply for American citizenship. She was asked to take the Oath Of Allegiance alongside Private Terry Takeshi Doi, an American born graduate of the Military Intelligence Service Language School at Fort Snelling who had lost his American citizenship when he was required to briefly serve in the Japanese army while attending school overseas. Audrey refused to take the Oath and stormed out of the courtroom saying, "How can I be sworn in alongside a man who belonged to an army now killing American boys?" It was later revealed that Doi, a Technician Fifth Grade Sergeant, was one of the first soldiers who had set foot on Iwo Jima... and had earned the Silver Star for entering a cave unarmed to urge Japanese soldiers to surrender. Audrey got blasted in the April 19, 1945 issue of "St. Paul Pioneer Press" for her anti-Japanese sentiments and the word of the controversy made it all the way to the American War Department, Military Intelligence Division in Washington. She never publicly apologized. By April 1960, Audrey and her husband were arrested in Marion County, Florida for "contributing to dependency of minors". 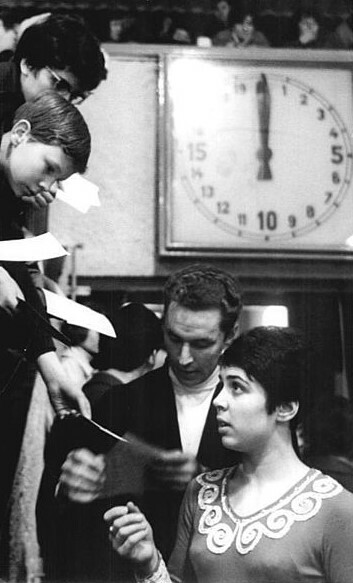 She was back in court in October 1961, suing a man she had been in an automobile collision with and the car's owner for fifty one thousand dollars, claiming she had been "disfigured by a scar and suffered shocks, cuts, bruises and leg and internal injuries". Audrey went on to become a mother and grandmother and started skating again at the age of sixty three, after two hip replacements and a fractured knee, at the Sunrise Ice Skating Center. She hadn't been in an ice rink in twenty five years. 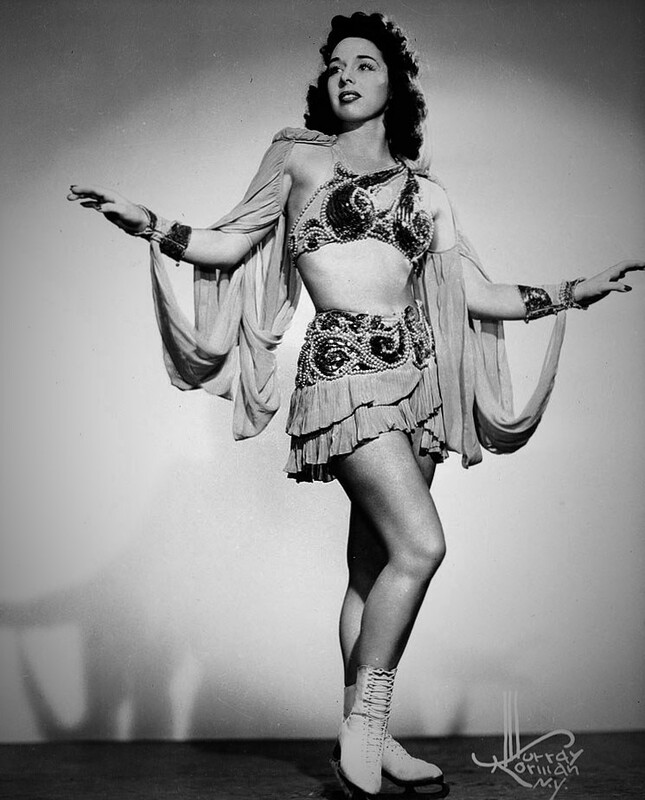 She lived out her days in Lake Worth, Florida, passing away on April 18, 1998 at the age of eighty. Her story serves as a reminder for many skaters, fame is short-lived and life after skating? Not always a fairy tale. 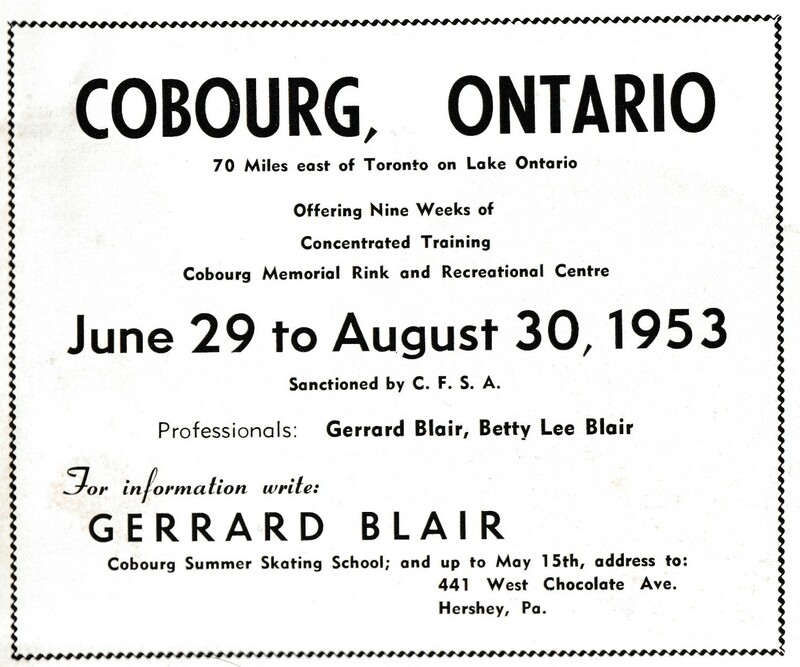 While war raged overseas in Europe, the Canadian figure skating community certainly felt the reverberations. The Hamilton Skating Club's annual opening tea was delayed by tea rationing until the club's executive could obtain a 'special tea permit' from the powers that be in Ottawa. The Toronto Skating Club donated two station wagons to the Blood Donor Service and stopped using props and stage sets in its annual carnivals for a time as the wood needed for the war effort. By 1944, an estimated fifty percent of adult male members of CFSA clubs were on active or defence duty. Winnipeg and Halifax rinks were taken over for military purposes and many skating clubs were forced to alter their programming or seek new arenas. When London, Ontario skaters lost their rink in St. Thomas, they were forced to skate outdoors in a park, investing their funds in victory bonds. Although we tend to glorify Canadian figure skating in the forties a little because of a fabulous little lady named Barbara Ann Scott, it really wasn't all sunshine, lollipops and rainbows. However, many talented up-and-coming skaters emerged on the scene in this period that have somehow fallen into obscurity over the years. Today we'll meet four of these fabulous figure skating folks and learn a little about their stories and accomplishments! Hailing from Oshawa, Ontario, Alan Anderson was considered something of a child prodigy in his day. As a youngster in 1945, he won his skating club's intermediate boy's title and the McLaughlin Trophy. The following he won the club's junior pairs competition with partner Nancy Burns. By 1950, he was a repeat winner of the club's senior men's title and was runner-up in school figures and the bronze medal winner at the Canadian Championships in the junior men's category. Again finishing third in 1951 behind Peter Dunfield and Charles Snelling, Alan moved up to second in the junior men's event at the Canadian Championships in 1952. A charismatic skater, Alan portrayed "Robin Hood" in a club carnival and wowed audiences with his interpretation of Franz von Suppé's "Light Cavalry Overture". Though he never managed to duplicate his success in the senior ranks, Alan's name is on a heck of a lot of dusty trophies at the Oshawa Skating Club. Like Alan Anderson, Dawn Steckley hailed from the Oshawa Skating Club and was considered something of a rising star in the mid to late forties. A versatile young skater, she excelled in figures, free skating, pairs and in an 'all girl trio' in the club's carnival. In 1953, she amassed three medals at the Canadian Championships at the Minto Skating Club in Ottawa: the junior pairs title with partner David Lowery and the silver medals in both the senior pairs and women's events, behind Frances Dafoe and Norris Bowden and Barbara Gratton respectively. Narrowly missing the medal podium in both the women's and pairs events at the 1953 North American Championships in Cleveland, Ohio, she retired from competitive skating after winning a bronze medal with Lowery in the senior pairs event and dropping to fourth in the women's event at the 1954 Canadian Championships in Calgary. While skating, she attended the Oshawa Collegiate Vocational Institute, where she won a scholarship for having one of the highest scholastic standings. She later coached at the Cleveland Skating Club. Sadly, Dawn passed away in 2002 of cancer. Once considered the 'next big thing' in Canadian women's skating, Nadine Adair Phillips' aspirations for gold were thwarted by the success of Barbara Ann Scott. After winning the 1943 Canadian junior women's champion, Nadine won three medals in the senior women's championships from 1944 to 1947 but she was never able to defeat Canada's Sweetheart. During her competitive career, she divided her training time between the Toronto Skating Club and Oshawa Skating Club. Known for her charming 'gay' style, she skated to everything from "Oklahoma!" to M.K. Jerome's "Sweet Dreams, Sweetheart". Tragically, Nadine passed away suddenly on February 24, 1947 in Toronto at the age of nineteen. Her cause of death was not announced. Canada at the age of sixteen. Following the War, he married Betty Lee, a pairs skater from Chevy Chase, Maryland and moved to the States to coach with his wife at the Hershey Figure Skating Club, the Westminster Figure Skating Club of Erie in Pennsylvania and at a rink in Orange, New Jersey run by the Essex County Recreational Commission. 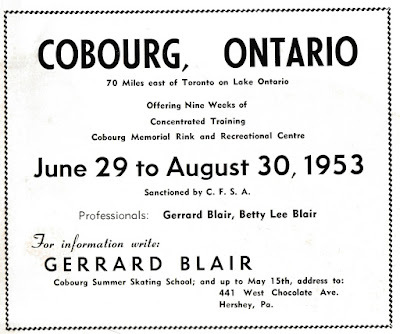 The Blair's later taught at the summer skating school in Cobourg, Ontario and in Toronto. Among Gerry's students was Paul Tatton, the 1954 Canadian Bronze Medallist. 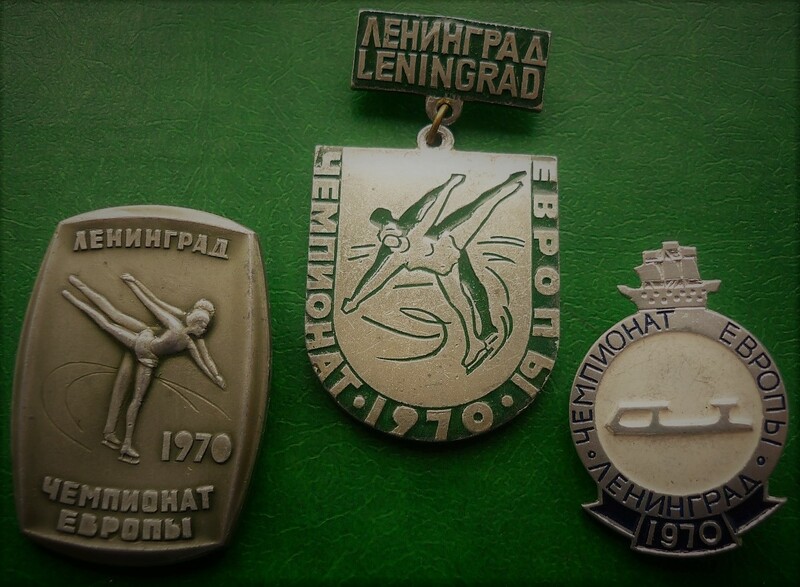 From February 4 to 8, 1970, twenty years before school figures were skated for the last time at the European Championships in the exact same building, Europe's best figure skaters convened at the Yubileyny Sports Palace in Leningrad for the 1970 European Figure Skating Championships. The event marked the first time since 1911 that the city had hosted the European Championships. It was held at the exact same time as the U.S. Figure Skating Championships in Tulsa, Oklahoma. The event received only scant coverage in the Western media as TASS (the Telegraph Agency of the Soviet Union) largely censored details of the event. Even Tamara Moskvina, who contributed a review to "Skating" magazine, required clearance of her article through the agency before it was released. Over three million requests for tickets were received, but the venue only had three thousand seats. With the stands packed to capacity, many Leningrad residents were forced to watch the event at home on television. To the delight of the home crowd, Soviet skaters won the most medals of any participating nation at the event: two golds, a silver and a bronze. 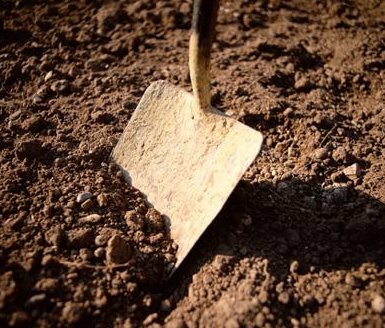 Today, we'll take an ever so brief look at some of the stories from this event, which has been largely shrouded in mystery for decades. Günter Zöller. Photo courtesy German Federal Archive. At the previous year's European Championships in Garmisch-Partenkirchen, Czechoslovakia's Ondrej Nepela had decisively won his first European title by outskating France's Patrick Péra. 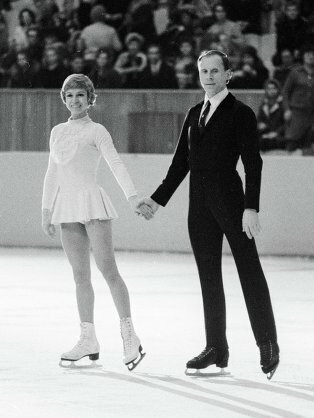 Mere days after Groundhog Day, it seemed like déjà vu to many when nineteen year old Nepela amassed a considerable lead in the school figures in Leningrad and coasted to victory with a conservative free skating performance. Günter Zöller, an auto mechanic from East Germany, took the bronze, knocking 1969 European Bronze Medallist Sergei Chetverukhin off the podium. A young Didier Gailhaguet placed nineteenth in his European debut. Trixi Schuba, Gaby Seyfert and Zsuzsa Almássy: medallists in the women's event. After the school figures, Austria's Trixi Schuba had a twenty eight point lead over two time European Champion Gaby Seyfert of East Germany, with Hungary's Zsuzsa Almássy third, Great Britain's Patricia Dodd fourth, Austria's Elisabeth Nestler fifth and Italy's Rita Trapanese sixth. Rebounding with an exceptional free skate and capitalizing on Schuba's relative weakness in the free skating, Seyfert moved up to narrowly claim her third European title. Schuba dropped to second, Almássy remained in third and Trapanese moved up to fourth place with a free skate that some thought rivalled Seyfert's. Yelena Alexandrova, a nineteen year old student from Leningrad who was fresh off an upset win at the Soviet Championships in Kiev, managed a seventh place finish to the chagrin of the home crowd. Irina Rodnina and Alexei Ulanov. Photo courtesy German Federal Archive. To the surprise of few, the indomitable Irina Rodnina of Moscow and her partner Alexei Ulanov, a student of the Gnesin Music School who excelled at playing the bayan, utterly dominated the pairs event, easily besting their Leningrad rivals, twenty one year old Liudmila Smirnova and twenty two year old Andrei Suraikin. The bronze medal went to the East German pair of Heidemarie Steiner and Heinz-Ulrich Walther. Heidemarie Steiner and Heinz-Ulrich Walther. Photo courtesy "Skating" magazine. Perhaps the most interesting anecdote regarding the pairs event in Leningrad surrounded a team who didn't even participate... Ludmila and Oleg Protopopov. The two time Olympic Gold Medallists had suffered a fall at the Soviet Championships that year that dropped them clear off the podium. Despite the fact that they'd clearly fallen out of favour 'at home' at that time, they were named to the European team but ultimately did not compete in Leningrad. Galina Karelina and Georgi Proskurin took their spot, placing a creditable fourth in their European debut. Early in the compulsory dances, Soviets Lyudmila Pakhomova and Alexander Gorshkov stood atop the leaderboard, ahead of West German siblings Angelika and Erich Buck and Britons Susan Getty and Roy Bradshaw. 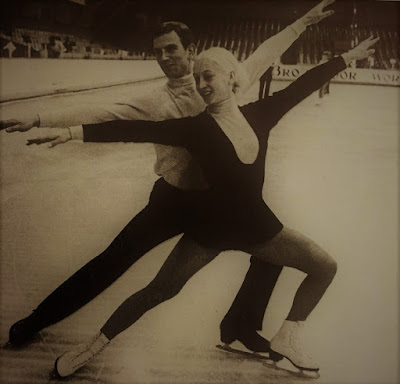 To the shock of many, unheralded Soviets Tatiana Voitiuk and Viacheslav Zhigalin (only tenth at the previous year's European Championships in Garmisch-Partenkirchen) moved up to third after the third compulsory dance. 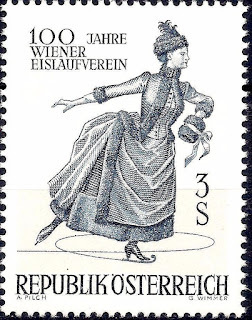 In her book "Figure Skating History: The Evolution Of Dance On Ice", Lynn Copley-Graves recalled, "The Bucks, well synchronized in the compulsories, seemed stiff to Tamara Moskvina, who attributed this aspect to their British trainer. Zharkova/Karponosov skated in a severely formal style, ending sixth. The elegant Muscovites Lyudmila Pakhomova and Alexander Gorshkov, stunned the spectators and judges with expressive complexity in a free dance to music by Grieg, Moniuszko and Beethoven, earning thirteen 5.9's and two 6.0's. They had become the first Soviets to win an ISU Dance Championship, and they did it for an ecstatic home audience in Leningrad." The Buck's settled for silver, Voitiuk and Zhigalin took the bronze and Britons Getty and Bradshaw finished a disappointing fifth, behind Annerose Baier and Eberhard Rüger of East Germany. Though we do know that Yuriy Samoilovich Zel'dovich was born in 1897, not much is known about his early life. As Zeld'ovich is a Russified version of the Jewish last name Zeldin, it is believed that Zeldovich was born to Belarussian Jewish parents who at some point emigrated to Moscow. Yuriy started skating at the "Petrovka, 26", an outdoor rink at a Moscow yacht club that was billed as the first "free school of figure skating" in Moscow in the early twenties. The "Petrovka, 26" school, managed by Nikolai Ivanovich Korabelshchikov, had daily evening group classes. 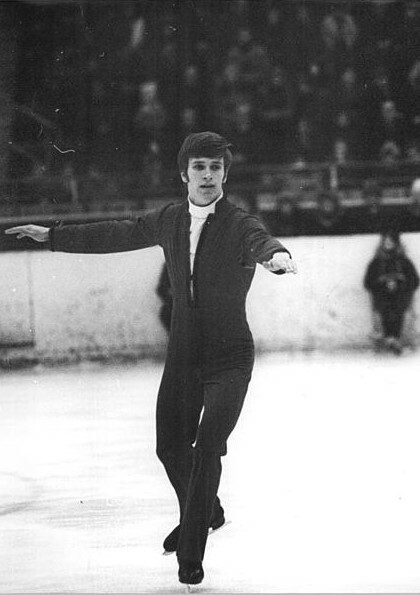 Yuriy attended these and received a weekly private lesson from Korabelshchikov, soon becoming "the best pupil of the school" according to Russian skating historian Yuri Vasilyevich Yakimchuk. Korabelshchikov paired Yuriy and another of his promising students, Anna Bykovskaya, and soon the duo began assisting their coach in teaching the club's other members. Yakimchuk noted, "The first serious test of the effectiveness of the yacht club school at the ice rink 'Petrovka, 26' was the participation of her pupils in the first USSR championship in figure skating, organized by the winter sports section of the Moscow Council for Physical Culture. The championship took place on February 24 and 28, 1924 on the skating rinks of the Mossovet Sports Club in Samara Lane, 22 and the River Yacht Club of the regional committee. As a result, all the first places were won by the representatives of the NRC: Yuri Stankevich among the newcomers, Yuri Zel'dovich among the senior figure skaters, and Zel'dovich-Bykovskaya in pair skating. The victory gave the club a great moral satisfaction and a conviction in the correctness of the chosen path. Unfortunately, none of the members of the club and pupils of the school then imagined that just a few days later, in accordance with the directive of the Higher Council for Physical Education... the Leningrad and Moscow Physical Culture Councils would order the dissolution of 'civil, private, public sports clubs and organizations, with the exception of 'Spartacus' and 'Dynamo'." This directive forced Yuriy to join the All-Russia Sports Society "Dynamo". He represented the "Dynamo" at the 1927 and 1928 Championships Of The USSR, winning the senior men's title on both occasions. In 1928, he also won an All-Union 'Olympic' competition put on by the "Dynamo" club. He retired from competitive skating after the 1929 Championships of the USSR, where he tied for first place with Konstantin Likharev as a five time Champion of the USSR. As the Soviet Union's membership wasn't even discussed by the ISU - let alone ratified - until 1947, there simply wasn't anything for Yuriy to 'go on' to. That didn't stop him from remaining incredibly involved in the sporting world. After his skating career ended, Yuriy graduated from the Medical Faculty of Moscow State University and became a doctor at the "Dynamo", working with football and hockey teams both domestically and on international trips. Konstantin Beskov and Mikhail Yakushin were among the many high level athletes he worked with. He was awarded the honourary title of Honored Doctor of Russia and in 1936, became the first chairman of the All-Union section of figure skating, which later became the Federation of Figure Skating of the USSR. In October of 1945, he was made an Honored Master Of Sports of the USSR. He was not only the third athlete in any sport to receive the honour, but he was the first figure skater. Despite his important contributions to Soviet figure skating, Yuriy died in relative obscurity on October 27, 1992 in Moscow of a heart attack at the age of ninety five. His skates were displayed in an exhibition of the history of "Dynamo" at the Academy of the Federal Security Service of Russia in September of 2013. Photo courtesy Library and Archives Canada, Acc. No. 1977-64-11. Though they lived their lives separated by the Atlantic Ocean, the two men whose stories we are going to explore today on the blog have two things in common: they made important contributions to the skating world as writers and died while serving their countries in World War II. 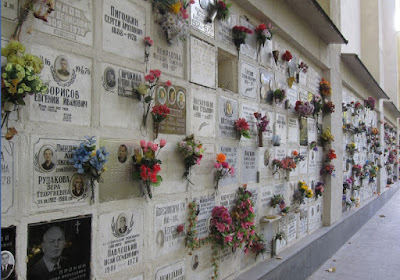 You may not have heard their names before today, but I think you'll agree that their stories are both sad and fascinating. 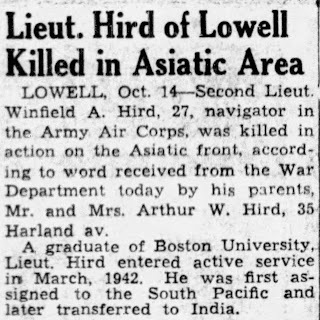 Born May 5, 1916 in Lowell, Massachusetts, Winfield Arthur Hird was the the only son of British immigrants Arthur and Lydia (Isherwood) Hird. His father was an overseer at a local cotton mill. Fascinated by the figure skating world as a teenager, he studied journalism at Boston University for four years. After completing his degree, he was hired by the USFSA to take over as the managing editor of "Skating" magazine. At that time, it was decided that the magazine's Publications Committee would serve only as an Advisory Council to Winfield and the production of "Skating" moved out of Theresa Weld Blanchard's home and into its own office. In his capacity as "Skating" editor, Winfield reported at USFSA executive and governing council meetings. He overhauled the design of the magazine, increasing the size of the type page and font allowing for easier reading. By 1942, subscriptions to the magazine had risen from five thousand, three hundred to six thousand, four hundred. Advertising revenue and the number of advertisers both rose and a marked increase in Canadian subscriptions was noted. Not only did Winfield make great strides in overhauling "Skating" and making it a more profitable venture, he also regularly contributed well-researched articles on figure skating history. Perhaps most notable was a wonderfully researched piece on the great Jackson Haines. You'd think Theresa Weld Blanchard would have harboured a little resentment toward the man who temporarily took over her job, but instead she expressed gratitude towards him. 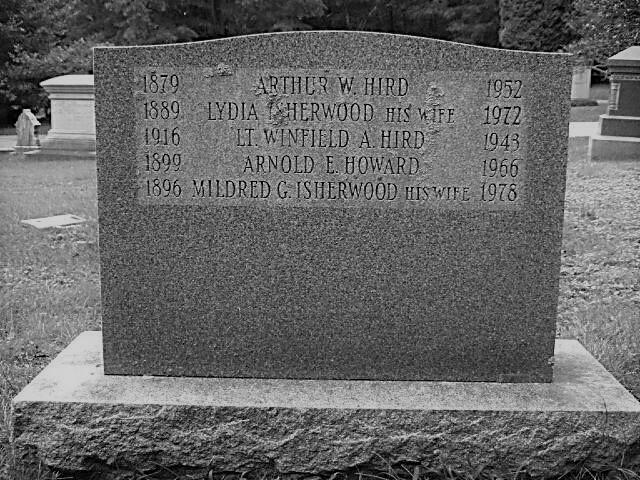 At the October 1941 annual meeting of the USFSA executive committee, she remarked, "Mr. Hird is doing a splendid job and has relieved me of much detail. His good work has been reflected in our improved financial position." 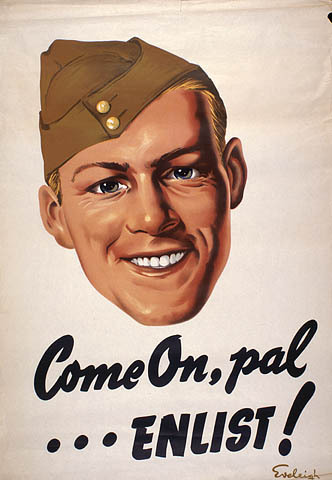 Everything changed on March 27, 1942, when Winfield was voluntarily drafted into the United States Army Air Corps. He returned "Skating" magazine to the capable hands of Theresa Weld Blanchard. She organized the donation of several of the magazine's typewriters to the war efforts and lobbied to send "Skating" free of charge to USFSA members serving in the military... including Winfield. 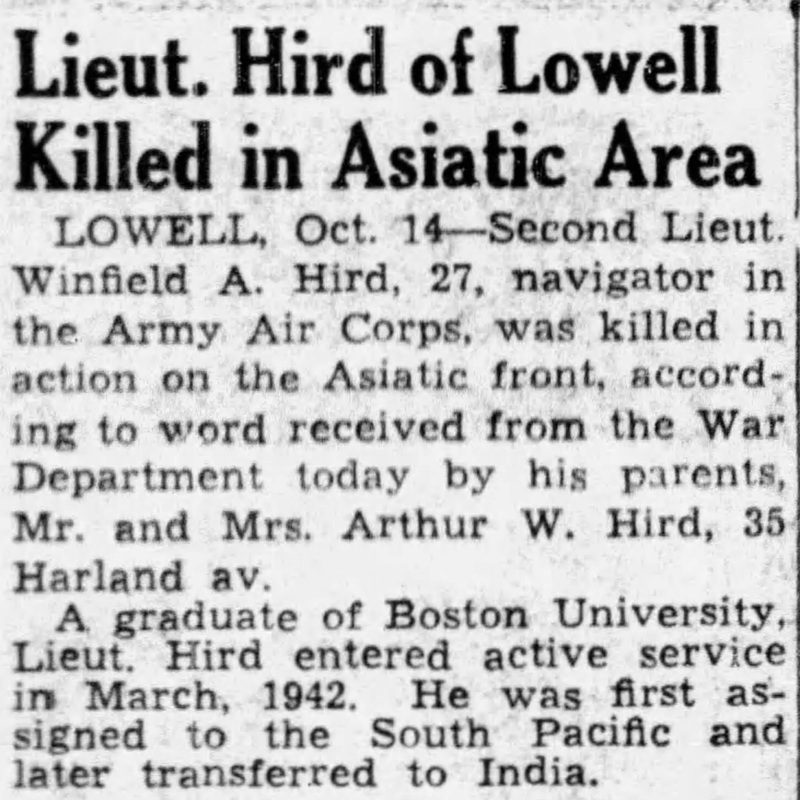 Sadly, after reaching the rank of Lieutenant, Winfield was killed in action on Asiatic front in October 1943 at the age of twenty seven. The same year he had enlisted, his sixty two father voluntary signed up for the draft. Instead, Arthur and Lydia Hird were left behind in Lowell to mourn the loss of their only son and Theresa Weld Blanchard was left with one fewer "Skating" magazine to send to China. Born in 1884 in Berlin, Germany, Artur Vieregg devoted much of his life to athletic pursuits. From 1923 to 1934, he served as President of the German Motorcyclist Association, organizing numerous motorcycle races at the Nürburgring in Nürburg and Schottenring in Vienna. In the winters, his 'need for speed' translated to the ice. Though a seven time medallist at the German Championships in men's figure skating, he quite never managed to defeat his chief competitors Werner Rittberger and Paul Franke. Internationally, he placed eighth at three European Championships and sixth at the only World Championships he attended in 1923. Andor Szende, Kathleen Shaw, John Ferguson Page, Ethel Muckelt, Dunbar Poole, an unidentified Swiss skater, Georges Gautschi, Werner Rittberger, Artur Vieregg, Zsófia Méray-Horváth and Gillis Grafström in Switzerland in 1925. Photo courtesy "Skating" magazine. 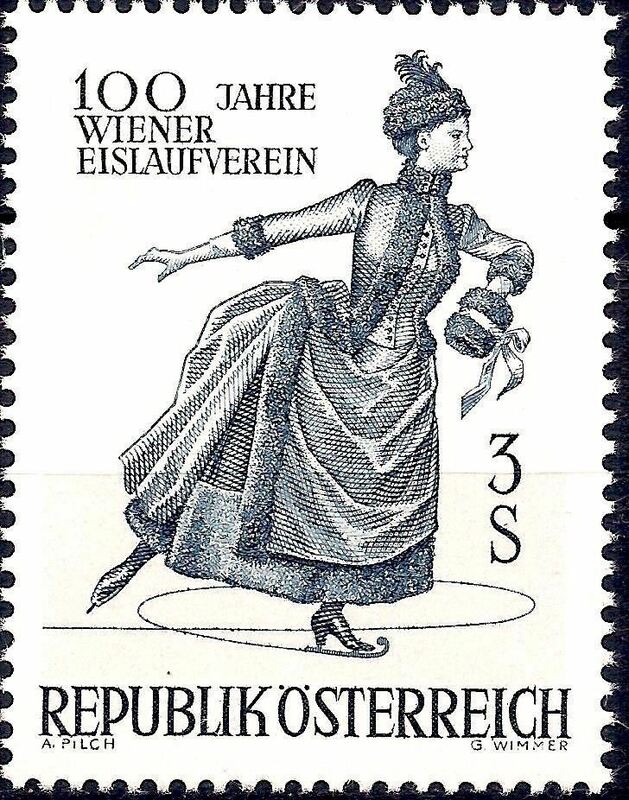 After 1926, Artur worked as a figure skating instructor and judge. He lectured at the German University of Physical Education (Deutsche Hochschule für Leibesübungen) in Berlin and served for five years as the Technical and Sport Director of Berlin Sportpalast. He also served for two year's as the German Federation's Secretary. However, Artur's most important contribution to the skating world was his dedication to educating the masses. He contributed to the book "Der tanz auf dem eise" and penned the highly popular and widely read instructional text "Der Eisläufer", later re-released by his friend and former rival Werner Rittberger as "Schule des Eislaufs". He produced one of the earliest instructional skating films, which was shown in Berlin and featured - according to "Skating" magazine - moving pictures of "the correct and incorrect methods of executing and teaching all school figures, also jumps and spins. It shows in addition a model program for free skating and for pair skating (Weise and Vieregg)." When World War II broke out, Artur joined the Wehrmacht and served as a Heer major in the army that fought in support of Hitler's vision. 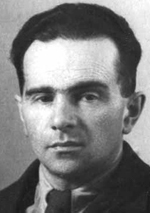 Captured as a German prisoner of war during the advances of the Red Army, he endured starvation and forced labour and died in Soviet captivity in 1946. After his death, Werner Rittberger - the inventor of the loop jump - recalled his late Nazi friend thusly: "I'm fond of my longstanding friendship with Artur Vieregg. [We] intimately connected through many nice sport experiences. A tragic fate snatched this sports man from us unfortunately all too soon." In the same format employed four years previous prior to the Lake Placid Games, The 1936 U.S. Figure Skating Championships actually consisted of two separate competitions. The first, held December 27 to 30 in New York City, featured competitions for senior men, women and pairs. The latter, held in February 1936 in Boston, had Silver (Championship) Dance and junior and novice events on the bill. The reasoning behind this division was to allow judges an 'up to date' selection process for deciding which skaters would be named to the 1936 Olympic team. The senior men's and women's school figures were held at The Ice Club, while the free skating finals as well as an exhibition were held at Madison Square Garden. For the third time, Maribel Vinson and Geddy Hill claimed the senior pairs title. They did so with little competition, as Grace and Jimmie Madden - who had won the title in 1934 in Maribel's absence - did not participate. Ten days prior to the event, Jimmie had sustained an ankle injury in practice. 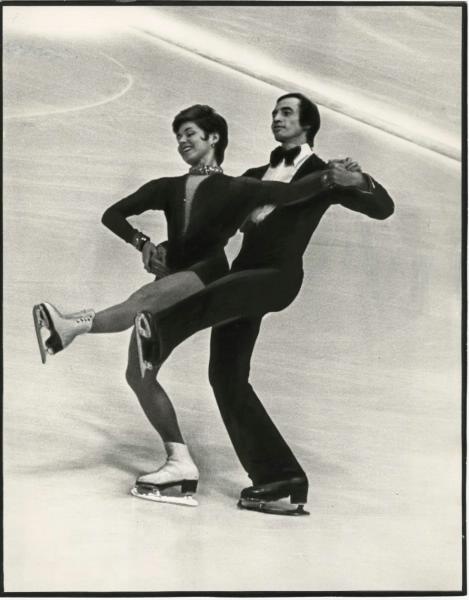 The silver medal went to Polly Blodgett and Roger Turner, also of The Skating Club Of Boston. At thirty four years old, Turner was more than twice Blodgett's age. The hometown favourites, Marjorie Parker and Howard Meredith, took the bronze. In fourth place was a married couple - Eva Schwerdt and William H. Bruns, Jr. - and in last place were fourteen year old Jeanne Schulte and fifteen year old Ollie Haupt Jr. of St. Louis. Sixteen year old Robin Lee of Minneapolis, who was represented the Skating Club Of New York as he trained there under Willy Böckl at the time, had no trouble defending his senior men's title either. After the school figures, he held a forty point lead over seven time U.S. men's champion Roger Turner. With a superb free skate, he received first place ordinals from all five judges. Turner finished only fifth in free skating and - though he tied in ordinals with Geddy Hill - dropped to fourth overall based on his total point score. The silver medal went to Erle Reiter of Minneapolis and fifth and sixth places were occupied by Ollie Haupt Jr. and Brooklyn's William Nagle. Reiter celebrated his nineteenth birthday during the competition. There were no surprises in the women's event either. In the school figures, Maribel Vinson racked up a sixty eight point lead over Louise Weigel of Buffalo. Skating to "The Lady In Red" - appropriately wearing red - Vinson earned unanimous first place votes in free skating on the way to her eighth senior women's title. Audrey Peppe, only fourth in figures, finished second in free skating and moved up to third overall behind Louise Weigel. Louise's sister Estelle finished fourth, ahead of Polly Blodgett, Ardelle Kloss and Katherine Durbrow. 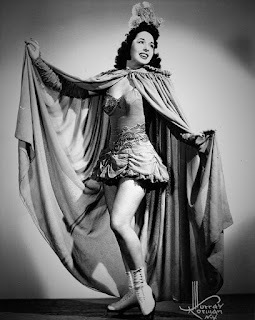 In "Skating" magazine, Richard L. Hapgood noted, "Although giving excellent performances, Miss Vinson did not skate quite up to her best in either singles or pairs. She was fighting a severe cold and bronchial trouble all during the events and was obliged to go to bed for a week afterward in order to recover and to recuperate her strength. It is truly remarkable what that girl can do. Besides holding down a very responsible position with 'The New York Times' - a position that is mentally and physically exhausting as well I know - and besides devoting a good deal of energy for the New York club, she can still keep her skating up to a high standard." Although the winners in the senior men's, women's and pairs events in New York City were in no way controversial, the competition wasn't without its fanfare and drama. Following the competition, the top four finishers in the singles events and the top three pairs were invited to skate in a closing carnival at Madison Square Garden sponsored by the U.S. Olympic Committee. This carnival drew in some eight thousand spectators and included a ceremony introducing the Olympic ski, speed skating and bobsled teams, a comedy skating act and exhibition hockey game between members of the American Olympic team and the New York Rovers of the Eastern League, as well as the official announcement of the 1936 Olympic figure skating team. Avery Brundage wished the athletes "godspeed and success" in an address that was broadcast on radio nationally. One of the bombshells that was dropped when the U.S. figure skating team was announced was the decision to name Grace and Jimmie Madden to the Olympic team. In fact, the injured Jimmie was named not only in pairs but in singles... based on his competitive record. This was one of the first instances of the USFSA considering a skater's 'body of work' when naming an Olympic team.Though he was a past U.S. Champion in pairs skating, the fact that he was named instead of Roger Turner - a seven time U.S. Champion in singles - was surprising. Polly Blodgett, Turner's sixteen year old pairs partner, was consequently 'skipped over' for the team as well, something that Turner resented for many years afterwards. Following the event, skaters and judges gathered at the Waldorf-Astoria - a hotel with a rich figure skating history of its own - for a supper and dance. On January 15, 1936, the U.S. Olympic team set sail for Europe aboard the American liner Washington. With little ceremony or press attention, the Silver Dance and U.S. novice and junior events were held in February in Boston. To delight of the hometown crowd, M. Bernard Fox was tops in both junior men's singles and pairs, winning the latter with partner Joan Tozzer. He was the first man in almost a decade to win both titles in the same year. Jane Vaughn and Katherine Durbrow, representing Philadelphia and New York respectively, came out on top in the novice and junior women's events. Manhattan's Edward Berkson, the son of a well-to-do film manager, won the novice men's title. Seven couples competed in the revamped ice dance competition, which consisted of four Silver Dances - the Continental Waltz, Tango, Foxtrot and Fourteenstep. The winners of the new Harry E. Radix Trophy were Marjorie Parker and Joseph K. Savage. Nettie Prantel and Harold Hartshorne and Clara Rotch Frothingham and F. Ashton Parmenter rounded out the top three.